Many first time home buyers seem to think they're either stuck with only one or two mortgage loan options, or they're looking for a specifically tailored loan for the first time buyer. However, the truth of the matter is as a first home buyer you have a lot of options. Depending on your financial situation, you may find yourself with any one of many options for financing that first house. One option often used by buyers like you are FHA loans. Let's take a look at what FHA loans are, and why so many first time home buyers seem to fall into the category of FHA. Download our Mortgage Loan Options Guide here, and learn more about what's available to purchase your first home. First of all, we need to understand that the Federal Housing Administration (FHA) does not actually issue mortgage loans. Instead, the FHA provides mortgage insurance to lenders like AmeriFirst Home Mortgage. This allows lenders to reduce the risk often associated with low down payment mortgages like the 3.5% FHA loans. That's one reason why first time home buyers tend to gravitate towards FHA: low down payment. Home buyers also like FHA loans because they have more liberal qualification requirements. Credit score requirements tend to be a bit lower than other mortgage loan programs. Debt-to-income ratios differ from other options – the general rule for FHA is that your house payment should not exceed 31% of your income. Adding your house payment to the rest of your debt should keep your total debt at or below 43% of your income. Higher ratios may be considered with compensating factors. FHA has no income limit and no geographic restrictions. You can also have non-traditional credit – great for self-employed borrowers. Now, back to the lower down payment requirement (as low as 3.5%) and other benefits. Buyers also have lower monthly insurance premiums with FHA loans, and often have lower closing costs. This makes the FHA option a very attractive loan for the first time home buyer, and for families with low-to-moderate income levels. Did you know that you can use an FHA loan to buy an existing home or build a new one? You can also use a special FHA loan to buy a fixer upper and pay for the home improvements with the same mortgage loan, amortizing the cost of that remodeling work over the life of the mortgage. That's called an FHA 203k. Under that heading, you have the Full 203k and the 203k Streamline. These loan options allow the borrower to close on a home that doesn’t meet FHA requirements, with the plan in place to make the necessary repairs to that home. You can also use the 203k loans to finance many desired home improvements into the life of the mortgage. FHA-eligible property types include approved condos, modular homes and manufactured homes with pre-approval. The home must be owner-occupied. Seller can contribute up to 6% of the sale price to help cover closing costs. Gift funds are also allowed to cover closing costs. So if you find yourself in a renter’s nightmare, and you're looking to narrow down your mortgage loan options, it's time to check out the latest eBook from AmeriFirst Home Mortgage. "The Only Mortgage Loan Options Guide You Need" will give you an education few other lenders will offer. AmeriFirst is a community mortgage lender, so we’re very interested in our community. 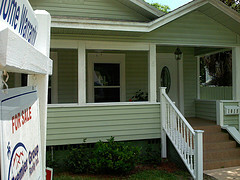 We want home buyers to understand the home buying process from mortgage pre-approval to FICO scores and down payments. An educated buyer is a powerful buyer, and one who’s less apt to have problems later. In this 12-page guide (you can download at the button below) you’ll find solutions to problems for first time home buyers with little or no down payment. You’ll discover the answer to the often asked question, "How do I pay for this kitchen remodel?" You’ll understand the difference between a fixed rate mortgage and an adjustable rate mortgage. We’ll even cover a few of the programs you’ve probably heard about – the “evil” sub-prime mortgages and other programs that gave lenders a bad name and left borrowers with a bad taste in their mouths. Download your copy at the button below and get started on your first time home buyer adventure. Maybe you'll end up leaning towards FHA loans. Maybe it's another option that's right for you. The guide below will help you narrow your focus.